I have been rather slack of late with regards to quality blogging as I am still basking in the after glow of a phenomenal dive trip to the Maldives as well as spending any free time sorting through pictures and videos from 4 cameras used on the trip. While on my trip I liberated a copy of the Red Bulletin from The BA Lounge and was interested by an article about Tom Cruise being invited along by Red Bull to test dive their Formula 1 car. I was particularly impressed in the comments in the article - when when of the guys said something to the effect of "if Cruise wanted he probably could race F1". After watching the video below I may have remembered the quote of context - if it was indeed David Coulthard who said it. After receiving this promo video showing Tom Cruise doing some of his own bloody impressive stunt work for Mission: Impossible - Ghost Protocol high up on the worlds tallest building - the Burj Khalifa in Dubai - I thought I would share. Of course the video doesn't show the safety precautions that any insurance company would necessitate before a mega star did anything as wild as this. But kudos to Tom Cruise for being one of the few action stars who could actually pull of some of the stuff their characters do on screen. Tom Cruise doing his own stunts on Mission: Impossible Ghost Protocol Behind the scenes featurette. Even though the last two Mission Impossible films have been fairly disappointing and firmly landing in the gilded style over substance category, (and even before this anticipation raising video) I had planned to be in the ever hopeful queue to see Mission: Impossible - Ghost Protocol. Release Date: Mission: Impossible - Ghost Protocol is in theatres and IMAX December 2011. The IMF is shut down when it’s implicated in a global terrorist bombing plot. 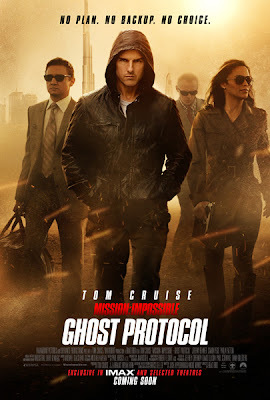 Ghost Protocol is initiated and Ethan Hunt and his rogue new team must go undercover to clear their organization’s name.